As I may have mentioned once or twice, my grandmother embraced convenience foods. TV dinners, box cake mixes, Kraft Macaroni and Cheese…these were foods I grew up with. But she had a secret. She had been sitting on a gold mine of retro recipes from random cookbooks. One day, long before I developed an interest in cooking, she handed them over to me. Maybe she knew that eventually I would embark on my own adventures in the kitchen. Or maybe she thought these might spark an interest in me to stop eating out of boxes. Whatever the reason may have been, those pages got tucked away in my three ring binder as more of a curiosity than anything. Many years, and several moves later, I finally took a look at them and realized that I had been given a window into the past. My interest clearly focused on the recipes for baked goods. Cakes, pies, cookies, and souffles called out to me. They beckoned to be brought to life. And so I shall. 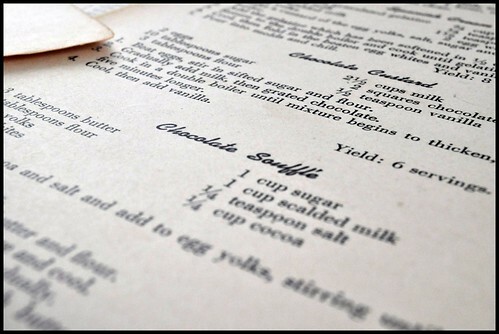 Retro Recipes will become a new feature here at BAH where everything old is new again. It worked for bell bottoms and skinny jeans; why can’t it work for recipes too? I posted the first Retro Recipe back in February, as I hunkered down for what evolved into SnOMG. Hopefully it won’t take Mother Nature unleashing her wrath again to get me moving on the project. Use the whole day as a unit rather than the individual meal, have breakfast simple, then plan dinner, then lunch. See that all classes of foods are used everyday, and whenever possible in each meal. Use some raw fruits or vegetables once a day. Plan to have in each meal one food which requires chewing, one which contains roughage, and one hot food. Alternate simple and less nutritious dishes with those which are richer, more nutritious and harder to digest. When foods are hard to digest, serve in smaller portions. Foods easily digested may be served in larger portions. Have a pleasing color combination in your food, then meals will be appetizing and well balanced. Serve foods in season, they are less expensive. Serve appetizing foods at the beginning of meals. Serve all hot foods hot, all cold foods cold. Avoid serving the same food twice in a meal. Change left over foods, combine with other ingredients to make new dishes. Budget money spent for food, do not feast for one meal and fast another. I promise you, this is not an April Fool’s. Somewhere, some publisher actually printed those words in a cookbook. Wendi–have a safe trip and cook/bake lots of wonderful things! Thanks Beth. If you could see the amount of pots, pans, trays, and misc kitchen gear I’m packing, you’d think I was never coming back. HMMMMMMMMMMM……somedays I think my approach to dinner is like Lucy Ricardo paying bills. You put the recipes all on a lazy susan, spin it, and the recipe that stays on gets made. May have to look into this method! Godspeed Wendi, go spread your sunshine and do what you do best! Have a safe trip! Try to keep it under 100mph K? Lara, I love the fact that you feel a connection to your grandmother through her old cookbooks. This made me a little misty eyed. We stand on the shoulders of those who came before us. Maybe not a bad thing to cook on those broad shoulders too! I never make pot roast like Mommy does without the wayback machine turning me into a 5 year old on the porch swing in the summertime when the windows were open and the whole neighborhood KNEW what we were having for dinner!